River Thames Jazz Dinner Cruise- Great food, tunes and views! All boats are equipped with panoramic views of the river. And if the weather stays nice you can even venture up on deck for a romantic cocktail by the lights of Southbank. Your entertainment during the cruise will be provided by ChiJazz, "smooth jazz for dining, dancing and enjoying". Performing a range of cool, ambient tunes, as well as more lively numbers, it'll be the perfect accompaniment for a chilled evening dining and socialising. ChiJazz has a extensive repertoire of tunes, ranging from jazz classics to contemporary pop tunes. Popular tunes performed by ChiJazz include: At Last, Cry Me a River, Girl from Ipanema, Have You Met Miss Jones, Makin' Whoopee, Mercy, Mercy, Mercy, Night And Day, Summertime, Yardbird Suite... to name just a few! 3 hour cruise with quintet ChiJazz, which will perform popular mainstream swing and latin jazz. Please note the menu options needs to be pre-ordered before the day of sailing. Menu orders cannot be taken on the night. The supplier cannot guarantee that products are free from nuts or traces of nuts. Gluten free meals are available with 24 hours advance notice. PLEASE NOTE: Due to the nature of river travel, it is not always possible to depart exactly on time as the cruise company are subject to a number of operational variables, many of which are outside of their control. They reserve the right to alter times, vessels and piers because of these variables. Celebrating 2 60th birthdays food was great fantastic service and great atmosphere. Along with amazing views along the Thames . A very enjoyable evening. Very friendly staff and an excellent band. Would definitely recommend to family and friends! We booked a group ticket and we thoroughly enjoyed ourselves. The music and the food was fantastic. We had a great time. Had a wonderful evening, food hot, drinks wonderful, staff very polite and hard working - band fantastic and London at night, how beautiful. Would definitely book again. Very pleased with the whole evening very polite staff good service food was good and the band were excellent. A very enjoyable cruise. From the moment we boarded the boat we were made to feel special. The waiting staff were polite and attentive and every course was well presented and tasted as good as it looked. It was also nice that between courses you had time to go outside and take photos of London by night, which looked amazing and gave us another great memory of our trip to take home with us. The Jazz band were brilliant, we've never listened to jazz as such before and we both thoroughly enjoyed it, and the music created a beautiful relaxing atmosphere to what we thought was the perfect way to experience London's beauty by night. 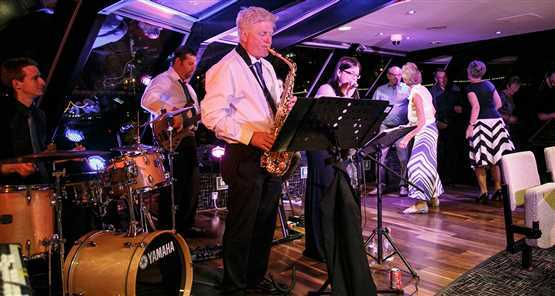 We try to visit London a couple of times a year and we thought that this jazz cruise was not only great value for money, but made for a truly memorable evening that we would recommend and I'm sure that on our next visit to London we would go on this cruise again or one that was similar. Had a great farewell dinner cruise on the Thames before we left London the following day. Great ambiance, music but sadly the food was beyond expectation. Overall a plus for the entire cruise. Really good night out, window table, great scenes on the Thames, very good food, good band and friendly staff!! Well worth the money! Would do it again!! My wife and I thoroughly enjoyed the cruise. The food, service and band were excellent. Also, the wine was very reasonably priced. Compared with other river cruises we have been on, it was very good value. Hope to go again. Please note the menu options needs to be pre-ordered before the day of sailing. Menu orders cannot be taken on the night. If you do not specify otherwise, you will be provided with the meat menu. Please note that menus cannot be mixed between non-vegetarian and vegetarian. Please note: this cruise is wheelchair accessible but the cruise operators are limited to the number they can carry on each boat. Any disabilities must be disclosed at the time of booking. All passengers on dining cruises must be physically able to walk on to the boats with an able bodied helper and unfortunately no electronic wheelchairs are permitted. In addition to being notified about customers with disabilities, it’s also important that any dietary or special requests MUST be specified at the time of booking. The cruise provider will always do their best to accommodate, however, at times this may not always be possible.